Back when I was still living in Tokyo, I had two tempura shops on my list, one was Kaneko Hannosuke and the other is Dote-no-Iseya. 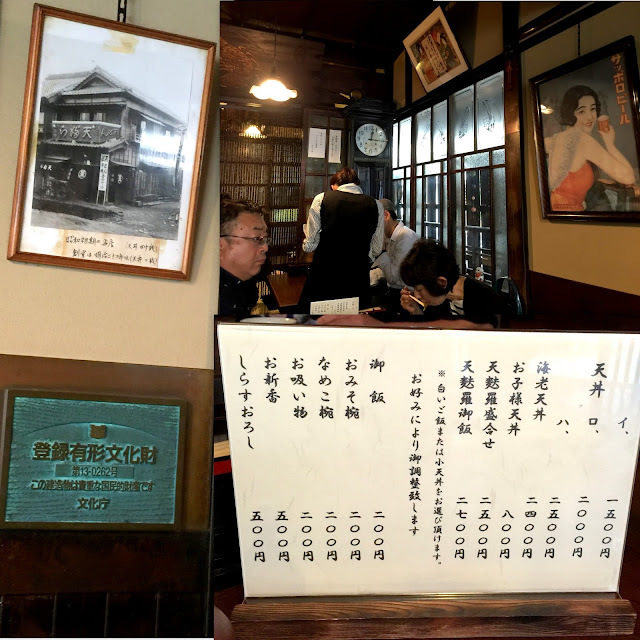 Located in the Taito area some distance away in the North of Asakusa, this restaurant is yet another tempura legend of Edo as it has remained in the same two-storey traditional wooden building since its establishment in 1889. From Kanto earthquake in 1923 to the land bubble of the economy in 1980s, Dote-no-Iseya has witnessed the monumental transformation of the city and is now under the helm of 4th generation owner Wakabashi-san. Stepped into and you feel as if you have been transported into a bygone era. There's an old clock, some faded advertisements of Sapporo beer and a painting of kimono-clad lady; glorifying the Showa years of post-war austerity. It is as much retro as it is a relic, a cultural relic that has been registered as a Natural Cultural Property of Japan. The Tempura Don comes in 3 different sizes, イ(¥1500) ロ (¥2000) ハ (¥2500) and every customer is required to order at least one. If you love Anago like me, opt for the ロ or the ハ size (aka the second largest and largest bowl). The main difference between these two is the seasonal vegetables and you can opt for lesser rice if you like. Compared to the delicious tendon at Kannesuko, the tempura batter is actually thinner, lighter and crispier. Both bowls are very similar but more tempura "Tare" (light brown tasty sauce) would help to jazz up the flavors of the bowl. The ingredients leaned slightly towards the side of dry and bland, but no extra Tare would be given even if you ask for more. On the contrary, I did not have any issue with Kannesuko's bowl except for the dreading long queue of nearly 2-3 hours. Do note that prices here are roughly twice the price of Kannesuko but still, you can tell clearly that this old shop has a strong following for that nostalgic taste of old Edo.